After dry fitting up the case to ensure the finger joints had a good fit I needed to pull it back apart and take care of a few details that would be difficult or impossible once assembled. 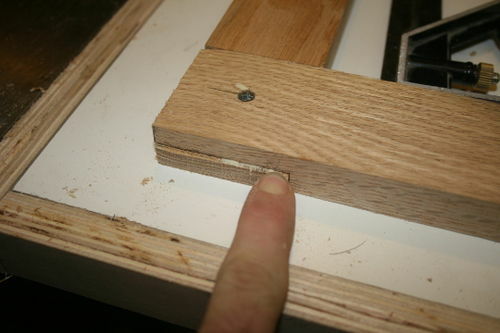 First, I needed to drill out the shelf pin holes in each of the sides. In the New Yankee Workshop (NYW) Norm uses a drill press and a specially marked fence to quickly and accurately drill out the shelf pin holes. Unfortunately I don’t own a drill press yet, so I had to improvise a little. Following Norm’s direction I marked out the first set of holes 5” from the bottom of the case and 1.25” away from each edge. Each set of holes needed to be 1” higher than the last set. I noticed that the rule on my combo square was 1” wide, so I used it to set my spacing, marking out lines for each hole. 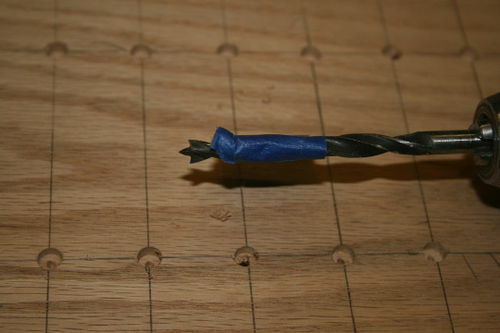 To set my depth I used blue painters tape to give me a 3/8” hole using a 1/4 brad point bit. Overall it worked pretty well. A few of the holes got a little squirrely, but they will be covered by a shelf so it won’t matter too much. After drilling out the shelf pins it was time for a quick sanding before assembly. I REALLY wanted to avoid using the sander and just use planes and my card scraper. For some reason I could not get my planes to work well with the oak. I’m not sure if it was because the lumber had already been surfaced at some point, or my blade was too dull..but it just wouldn’t cut like I wanted. The card scraper did a little better, but still didn’t get me the results I was after. Eventually I gave in and used the random orbit sander on the inside faces of all the boards moving from 120 through 220. I don’t really want to hassle with trying to sand the inside faces once the cabinet is all glued up and put together. The outside faces also got a quick run through with 120. I didn’t want to bother with high grits at this point, knowing there would be some squeeze and fine tuning of the finger joints. No pictures of the sanding process – it was boring and dirty – like always. With the sanding taken care of it was time for assembly. I always have to slow myself down when it comes to assembly. I always get excited when a project starts looking like a piece of furniture and so I try to rush through assembly and glue up so I can show it off to my wife. I tried to channel a little Norm and slow myself down, making sure to use my speed square to get everything as square as possible. 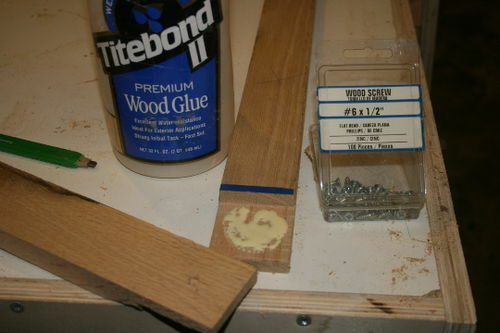 Each set of fingers got a little smear of glue and then fit together with a little tap from the mallet to get it seated. I grabbed a few pine cut offs for cauls, slapped some packing tape on them to get the squeeze out from making them a permanent part of the project and clamped it down. The top cauls were made out of melamine cutoffs I had laying around from another project. These really worked well – no packing tape necessary, and they were nice and flat. At this point I walked away from the case to let it dry and moved on to milling up the parts for the face frame and glass door. The face frame was up first. Norm makes a point in the book to explain that the vertical frame members are “stiles” and the horizontal members are “rails” I am trying to commit this to memory because I can never remember which is which. I had to rip down some 4/4 boards in 2 inch wide strips to make up the stiles and rails for the frame and door. Since all of the rails are the same dimensions and the stiles are all the same dimensions, it made sense to cut them all to size at the same time. This worked out well, it gave me an opportunity to pick the pieces with the best grain for the door (the most visible part) and the more defect looking pieces for the face frame which would be hidden most of the time. The picture only shows 1 set, but there are two, and they look identical. The stiles are 25” and the rails are 20” long. 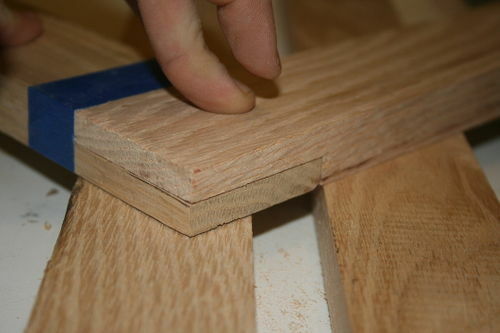 The face frame is joined together using lap joints. Even though this is a simple joint, it was brand new to me. This is one of the reasons why I started this mission in the first place. I’ve cut mortise and tenon joints, made frame and panel on the table saw, etc. 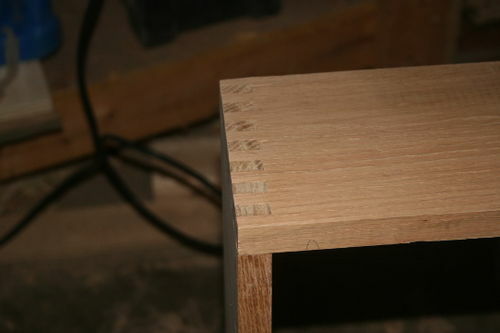 but never have I cut a lap joint. In the book Norm recommends a radial arm saw with a dado head…I don’t have a RAS, but I do have a table saw with a sweet new dado stack. 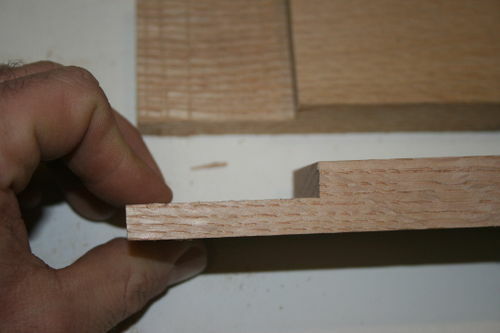 For the lap joints to work the dado blade needs to be raised high enough to remove exactly half the stock of each rail and stile – equal to width of each piece. Sorry if that sounds screwy…the picture is easier to follow than my explanation here. 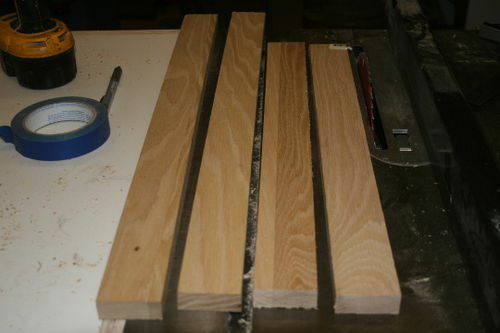 The first picture shows the lap joints cut – half the thickness (3/8”) removed. 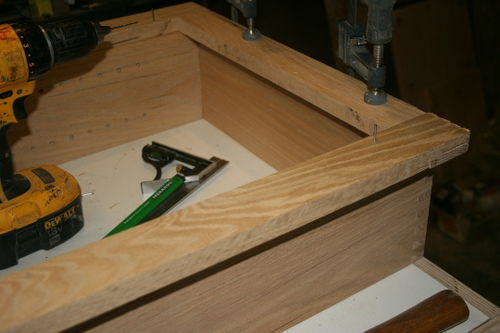 Making sure to keep everything square, the lap joints are glued and screwed together using #6, 1/2” wood screws. I’m personally not a huge fan of using screws or nails in my projects, but I am trying to say as true to the approach laid out in the book as I can. So glue and screws it was! The idea is, the screws are supposed to act like clamps, holding the piece together so you can continue working while the glue sets. And that’s exactly what it did. After assembly I noticed some overhang on some of the lap joints. I used the bench top belt sander to knock them down quickly – not a big deal – but an example of not cutting close enough to my line – measure twice cut once! With the face frame completed I left the shop for a bit to take care of a few things and let the glue on the case finish setting up. When I came back I pulled the clamps off of the case and was very happy with how it came out. I gave the fingers a quick sand/scrape to get them flush with with the sides. Although I was happy with how they came out, I did notice some small gaps on one set of fingers. I think this was due to clamping and gluing it up while it was standing up instead of laying on it’s side. Not a huge deal, but something I’ll keep in mind the next time I do a glue up like this. With the fingers flush and the face frame glue up ready to go, it was time to attach the two. From the pictures in the book it looks like Norm attaches the face with brads or finish nails, but there wasn’t any instruction to support this – so I made an executive decision and decided to use finish nails. The face was attached with an 1/8 overlap on the inside of the bottom to give it a little lip, and the top edge of the face frame is proud of the top of the box by about the same. I imagine this is to allow for wood movement – things that start out flush rarely stay that way. With the face frame attached it was time to call it a night. 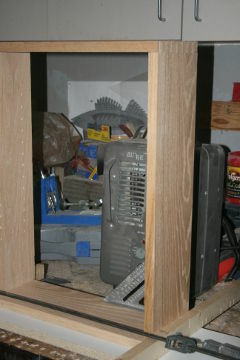 The next steps for the project involve creating the door and insetting the mirror, routing out a rabbet in the back of the case to accept a piece of 1/4” oak ply, attaching the door with a piano hinge, and finishing the whole thing. Saw that you were a new member to the forum, WELCOME! If you ever have any questions don’t hesitate to ask. You’ll learn a TON on this site from other members.